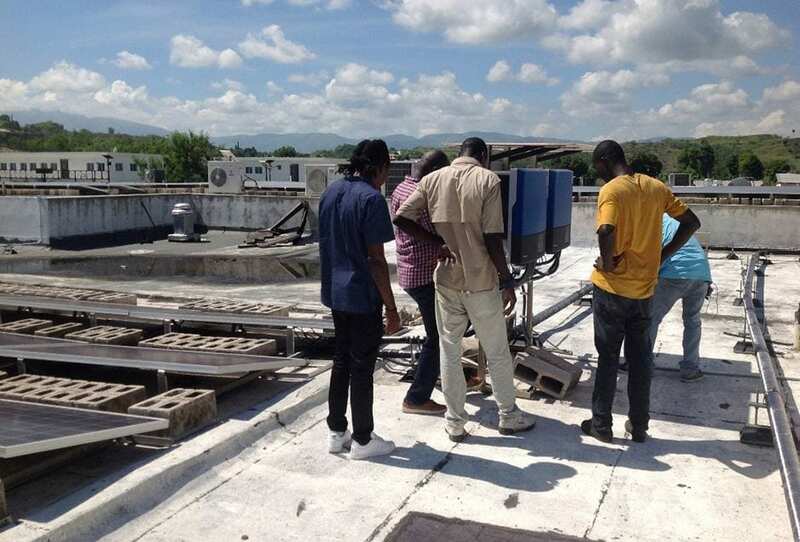 Facilities staff anchor a communications antenna on the roof of University Hospital in Mirebalais, Haiti, in preparation for Hurricane Irma. Nearly a year after Hurricane Matthew battered Haiti’s southern coast, the Caribbean nation is preparing for another blow, this time from Hurricane Irma. The Category 5 storm could make landfall across a northern swath of Hispaniola, hitting the Dominican Republic and Haiti as early as Thursday morning, according to the National Hurricane Center. Meteorologists predict winds of up to 180 miles per hour and torrential rains. Several public hospitals and clinics supported by Zanmi Lasante, as Partners In Health is known in Haiti, lie in the storm’s predicted path. At sea level on the west coast, Hôpital St. Nicolas in St. Marc is expected to receive the worst blow from heavy rainfall and flooding. 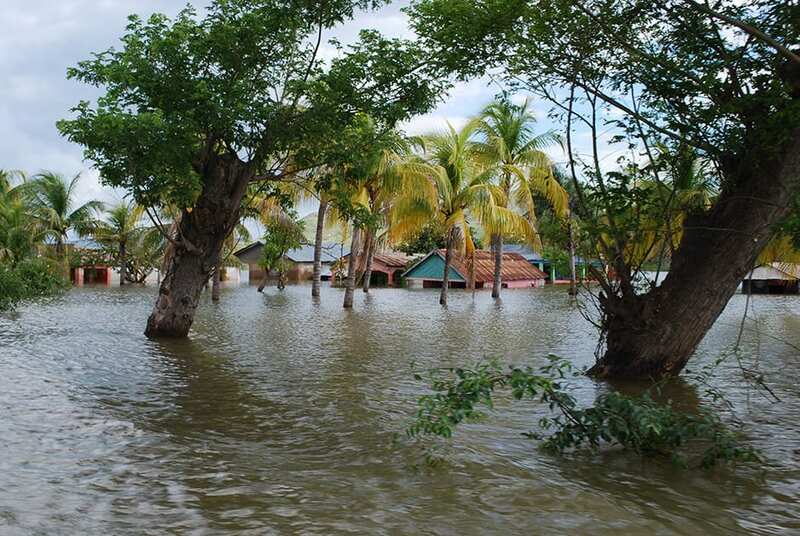 Other facilities near the Artibonite River, such as those in Belladère, Cerca-La-Source, and Boucan Carré, could suffer from flashfloods and mudslides, said Sheila Davis, PIH’s chief clinical officer. University Hospital staff in Mirebalais spent most of Tuesday covering exposed walls with plastic, filling sandbags, fueling vehicles, and storing extra water in preparation. “The team there is taking preparedness very seriously,” said Dr. Paul Farmer, a PIH co-founder and senior strategist, who spoke today from Haiti. University Hospital is the largest physical structure in the region and could serve as a shelter during and after the storm. “The hospital itself is secure and built to withstand a major earthquake,” he added. Irma follows less than two weeks after Category 4 Hurricane Harvey slammed into Houston, Texas, dropping a record 52 inches of rain, and less than a year after Category 4 Hurricane Matthew killed 546 people and left 1.4 million in need of urgent aid in Haiti. Experts have labeled Irma a Category 5 hurricane, the most severe form, and expect it to be extremely violent and deadly. Most rural Haitians live in houses built from mud, stones, sticks, and corrugated metal. Many are subsistence farmers who rely on their crops, livestock, and fruit trees for food and extra income. “A Category 5 storm, if close enough to Haiti, will take off roofs … and wash people away if they’re anywhere near someplace that might flood,” said Farmer, who has weathered numerous severe storms in Haiti and will again this week. Farmer added that despite the fears of a potentially devastating storm, the strong preparation he has seen in central Haiti reflects decades of work in the country to improve health systems and resources—and the resilience of people who have endured significant disasters in recent years. A flooded neighborhood in St. Marc following Hurricane Ike in 2008.